This is my old mobile - this summer (2018) I will update this page with my new mobile info. I purchased an HF mobile rig (Icom 706MkIIG) in spring 2003 to use while we vacationed. 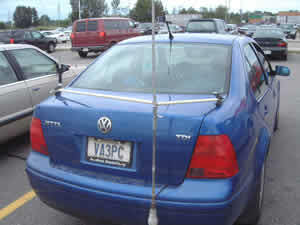 Somehow I managed to fit it in the Jetta along with my GPS, VHF/UHF dualband radio and the family! Here are some pics. The curly cord goes up to the GPS on the dashboard. 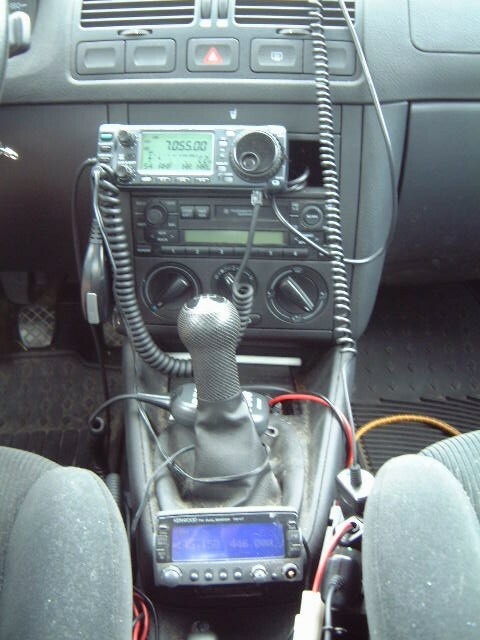 I use a three way splitter in the passenger compartment to power the GPS, Kenwood V7A and either the cellphone charger or when there is no road music to listen to, a CD player with built-in FM transmitter to play over the car stereo. 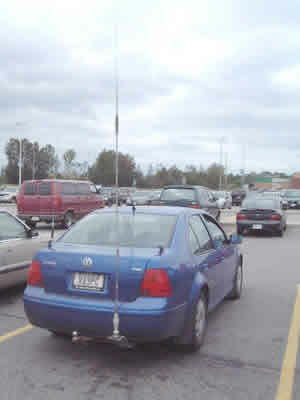 As you can see, with the Hustler 40m resonator on the mast, the antenna gets quite large. You may be wondering how I stop the antenna from flailing the trunk lid when I am driving. Well I wondered that too. 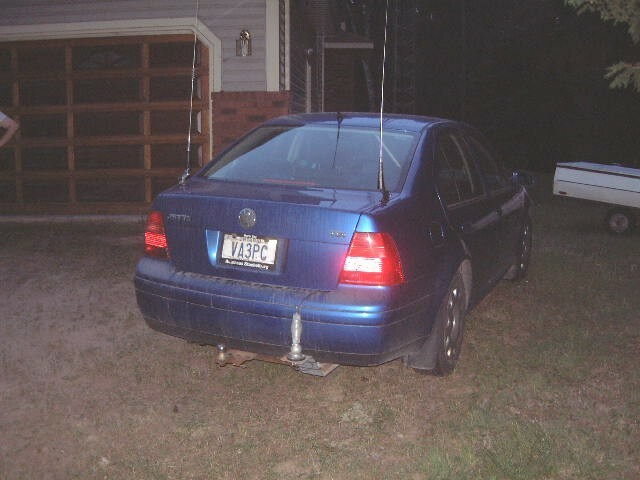 As I got the antenna mounted just before my trip west, I had to improvise a stability system in a hurry - and I came up with half inch pvc tubing to the trunk lip mounts. See the picture below left. It ain't pretty, but it works! The trunk lip mount on the passenger side of the car can accomodate a 6m antenna when I take the low band antenna off. When I do the car almost looks normal (for a ham that is!). That picture is on the right below. How does it work you ask? Well I participated in the 2003 RAC Canada Day contest mobile VE3. Made over 100 contacts on 40 and 80m and worked all provinces/territories except Nunavut and NorthWestTerritories. I made many other contacts after the contest going to and from the west coast including one with Hank W0RLI - the original author of the BBS software I used to run at VE3KOI BBS in Milton. My most recent adventure has been getting my TinyTrack3 up and running. Here is the story on my APRS settings, and just click on my callsign (upper left corner of the page) to see where I am now. © 2003-2007 VA3PC Software. All rights reserved. Design by Free CSS Templates.